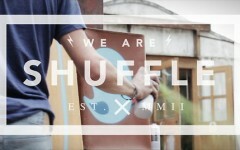 OFF CANVAS – Ben Eine from Studio Stare on Vimeo. In October 2011, Converse proposed an unconventional approach to support China’s first-ever Design Week launching in Beijing. Converse created “OFF CANVAS”, a street-level exhibition of typography featuring six international and local artists notorious for their artistry of words. Culling from the diverse worlds of graphic design, art, and graffiti, the installations revealed communities and canvases where China’s emerging scenes in indie music, art, fashion and skate are based.